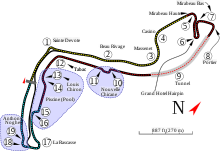 The 2004 Monaco Grand Prix (formally the LXII Grand Prix de Monaco) was a Formula One motor race held on 23 May 2004, at the Circuit de Monaco; contested over 77 laps, it was the sixth race of the 2004 Formula One season. The race was won by the Renault driver Jarno Trulli. The BAR driver, Jenson Button finished in second position, one second behind Trulli. Rubens Barrichello took the third and final podium spot for Ferrari. In fine conditions Trulli beat Button to the first corner off the grid, and the fast starting Takuma Sato beat Kimi Räikkönen and Michael Schumacher to fourth place before retiring at the end of the second lap. On lap three the safety car was deployed due to a collision between David Coulthard and Giancarlo Fisichella, with the race resuming on lap seven. The two Renault drivers, Trulli and Fernando Alonso remained close together at the front of the race until the pit stops which briefly saw Michael Schumacher lead the race. Alonso retired after crashing trying to lap Ralf Schumacher, and a second safety car period ensued. After briefly leading, Michael Schumacher retired behind the safety car following a collision with Juan-Pablo Montoya, who subsequently finished fourth. Schumacher's retirement elevated Button to second, and Trulli to the lead. Button subsequently reduced Trulli's lead, and the pair raced closely until the finish. The race was Trulli's sole victory of his F1 career. The retirement of Michael Schumacher, the defending Drivers' Champion, brought to an end his run of five successive victories from the inaugural race of the season. The race result had no bearing on the Drivers' Championship standings, and despite his retirement, Schumacher departed Monaco as the points leader, ahead of Barrichello and Button. Trulli's victory placed him ten points ahead of his teammate Alonso. Ferrari maintained their lead in the Constructors' Championship, 36 points ahead of Renault and 48 ahead of BAR, with 12 races of the season remaining. Four practice sessions were held before the qualifying session, two on the Thursday before the race, and two on Saturday morning before the qualifying session. The driver's championship leader, the Ferrari driver Michael Schumacher, was fastest in all four practice sessions, and in the final session set a record lap time for the Monaco circuit, of 1:14.014. Schumacher's record time was set in response to a fast lap time from Jarno Trulli. The Jaguar driver Mark Webber suffered an engine failure in the final practice session, and for changing his engine suffered an automatic 10 place grid penalty for the subsequent qualifying session, a penalty also suffered by Ralf Schumacher, for an engine failure in the first practice session. The Bridgestone tyres used by Schumacher were inferior to the Michelin tyres used by the Renault, BAR and Williams teams at the Monaco weekend. In the weeks before the Monaco race Bridgestone had worked with the Ferrari team on tyres that could perform a fast single lap during qualifying and the opening laps of the race. Schumacher had set his fast practice times on soft tyres, but after his tyres had struggled on a slippery track, Schumacher and the other Bridgestone teams returned to hard tyres. Michael Schumacher had won pole at four of the last five races. In recent years the Monaco Grand Prix had rarely been won from pole position, the last winner from pole before 2004 had been Mika Häkkinen at the 1998 Monaco Grand Prix and Michael Schumacher at the 1994 Monaco Grand Prix. The first four fastest times in qualifying were set by cars with Michelin tyres. The Sauber team decided to use the soft Bridgestone tyre and their performance had suffered, with their drivers qualifying 10th and 16th. The Renault driver Jarno Trulli set his pole time of 1m13.985s, it was the fastest ever recorded around the Monaco circuit, and was the first pole position of his career. His time was 0.411 faster than the next driver. Trulli had previously started on the front row at Monaco in 2000. Of his first pole Trulli said that "I'm pretty impressed over my lap time because I couldn't believe I lapped under the 14s...I put in a very impressive lap. In Monaco, being on pole, which is something I have chased for such a long time, I'm so pleased." The BAR driver Jenson Button started the race alongside Trulli on the front row, although the Williams driver Ralf Schumacher had qualified second, he was demoted to twelfth for changing his engine. Ralf Schumacher had qualified on pole at Monaco at the previous year's race. Trulli's Renault teammate Fernando Alonso qualified third, with Michael Schumacher eventually qualified fifth. Michael Schumacher was moved to fourth following his brother Ralf's demotion. Takuma Sato qualified seventh after a fast time in the first sector of the circuit, but a driving error damaged his chances of a quick lap. "...Where we will end up from our situation is the big question. Monaco is a long race, it's not optimum where we start from, we're not very happy about that, but what can you do?" Following the qualifying session, a mini-bus carrying the session's three fastest drivers was hit by a car. No one was hurt in the incident. Trulli described the accident as "...a big surprise...Maybe they thought we had not taken enough risks already on the track. But I don't think so. Not during qualifying in Monte Carlo." The race began with Trulli on pole and BAR's Jenson Button behind; Renault's Fernando Alonso and Michael Schumacher occupied the second row. After two aborted starts (Olivier Panis stalled his Toyota and Trulli's Renault leaked coolant onto the track) the parade lap began; Panis stalled again and started the race from the pits. As the race began, BAR's Takuma Sato made an excellent start, moving from eighth to fourth in seconds. Presently Sato's engine began smoking; on the third lap, it exploded spectacularly and released an enormous cloud of smoke, in which Sauber's Giancarlo Fisichella collided with McLaren’s David Coulthard and overturned. Both drivers were unhurt but out of the race, as was Sato. Out came the yellow flags, and the race proceeded under the safety car until the eighth lap, at which point Alonso fought Trulli for the lead, followed by Button. When the race restarted, Juan Pablo Montoya moved past Rubens Barrichello to take sixth position, and Trulli set three consecutive fastest laps, but was only able to increase his lead to 1.2 seconds over Alonso. The leaders began their first pit stops on lap 18, and by Michael Schumacher's stop on lap 26, Trulli led from Alonso, with Schumacher now in third ahead of both Kimi Räikkönen and Button. On lap 28, Räikkönen retired with mechanical troubles, joining Jaguar's Christian Klien and Mark Webber, as well as Jordan's Giorgio Pantano and Minardi's Gianmaria Bruni on the sidelines. "...I've been waiting so long to win and it came at the best race in Monaco...In the end I just took no risks. I was just doing what I had to do and just responding to the lap times and there was no point taking any risks. Everything was under control...It has been a faultless weekend and it is the best way to win – being on top all weekend"
Jarno Trulli, following his victory in the race. In an attempt to lap Ralf Schumacher, who was down in 11th position, Alonso tried to pass him offline around the outside in the tunnel and crashed heavily. Alonso was enraged by this incident, and publicly accused Ralf of dangerous driving. The safety car was immediately deployed, and all of the front-runners (except Michael Schumacher and Montoya) took the opportunity to pit. While following the safety car, Schumacher locked his left front tyre in the tunnel in an apparent attempt to generate heat in his brake pads and discs ahead of the restart. Montoya, directly behind, moved to the inside trying to avoid running into the back of Schumacher. However, as Schumacher continued there was no space between his car and the barrier for Montoya's and he clipped Montoya's left front tyre with his right rear, spun sideways and hit the barriers. This accident ended Schumacher's hopes for a sixth consecutive victory and a perfect season. Upon investigations, the stewards declined to apportion blame to either driver. As the order settled down towards the end of the race, Trulli led from Button, with Barrichello in third. The top three were a lap in front of the rest of the field, and the only drivers with a chance of winning the race. Barrichello needed to pit with 22 laps remaining, and rejoined too far behind the top two in order to make a challenge. From then on, it was a straight fight between Trulli and Button, but Monaco is notoriously the hardest circuit to make a passing move on. Therefore, Button having no chance of passing, Trulli took the win by close to half a second. Having won the first Grand Prix of his career, Trulli was left literally speechless, cancelling interviews and having teammate Alonso conduct interviews on his behalf. The bottom 6 teams in the 2003 Constructors' Championship were entitled to run a third car in free practice on Thursday. These drivers drove on Thursday but did not compete in qualifying or the race. † Olivier Panis started from the pit lane after he stalled at the start of the parade lap. †† Ralf Schumacher received a 10 position grid penalty for an engine change on Friday. ^ "Monaco GP -Preview". Grandprix.com. 19 May 2004. ^ a b "Practice 4: Michael Again". Autosport. 22 May 2004. ^ a b c d e f g h Maurice Hamilton (23 May 2004). "Trulli Knocks Schumacher off Pole". The Guardian. ^ a b c d e f "Trulli Takes Pole in Monaco". Autosport. 22 May 2004. ^ a b c Gary Emmerson (22 May 2004). "Trulli Puts Amazing Lap for Pole – Monaco GP". Autosport. ^ "Trulli Savours 'Amazing' First GP Win". Autosport. 23 May 2004. ^ Henry, Alan (24 May 2004). "Monaco grand prix: Schumacher's run ends in farce and fury". the Guardian. Retrieved 17 September 2018. ^ "Schumacher and Montoya cleared". motorsport.com. Retrieved 17 September 2018. ^ "Stewards take no action in Montoya-Schu shunt". crash.net. 23 May 2004. Retrieved 17 September 2018. ^ "Trulli loses voice after Monaco Thrills". The Star. Retrieved November 5, 2017. ^ Autosport.com. "Autosport". www.gpupdate.net. Retrieved 17 September 2018. ^ "2004 Monaco Grand Prix - Saturday Qualifying Results". Formula1.com. Formula1.com Limited. Archived from the original on 25 September 2013. Retrieved 27 December 2015. ^ "2004 Monaco Grand Prix - Race Results". Formula1.com. Formula1.com Limited. Archived from the original on 16 November 2014. Retrieved 27 December 2015. ^ a b "Monaco 2004 - Championship • STATS F1". www.statsf1.com. Retrieved 19 March 2019. Henry, Alan (2004). Autocourse 2004–2005. Hazelton Publishing. ISBN 1903135354. Wikimedia Commons has media related to 2004 Monaco Grand Prix.